“…For a moment, the figure remained standing, swaying ever so slightly, fitfully illuminated by flashes of lightning-and then it began to fall, like a tree toppling, slowly at first and then faster, before crashing facedown across the threshold. Constance backed up with a cry, Pendergast arrived at a run, followed by Proctor. Pendergast grasped her, pulled her aside, and quickly knelt over the young man. He gripped the figure by the shoulder and turned him over, brushing the hair from his eyes, and feeling for the pulse that was so obviously absent beneath the cold flesh of the neck. “Dead,” he said, his voice low and unnaturally composed. Delivered to his doorstep was Pendergast’s son, enemy, adversary. Dead. Murdered. So begins the 14th installment of the Agent Pendergast series. Pendergast will need to search into his own past and his own family’s transgressions to find the murderer of his estranged son. He will also need to help solve a murder in the New York Museum of Natural History where many of the horrors of Pendergast’s career began. From New York to Arizona to Brazil to Switzerland, and back to New York, Pendergast will follow the trail of the killer. Only learning perhaps too late that the killer has taken vengeance on Pendergast himself. Can he solve this murder before his own life is gone? What is so awesome about a Preston/Child novel is that they don’t insult the intelligence of the reader. In fact they challenge it. With obscure science and forensics, the have created in Agent Pendergast a hybrid of James Bond and Sherlock Holmes. Immensely intelligent and not shy with a gun when required. The supporting cast has also grown over the novels. Detective D’Agosta, Constance Green and others fill the world of these novels and carry their own quite well. 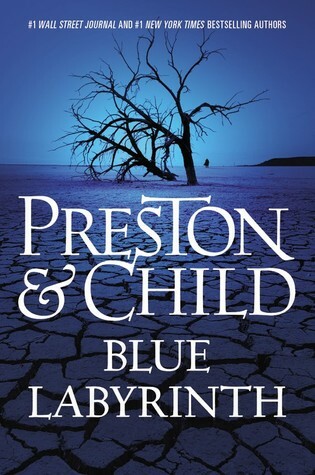 In Blue Labyrinth they have to carry more then their normal share as Pendergast is infected with a poison of his own ancestor’s making and is slowly dying. It is left to Constance and the team to catch the murderer and find an antidote to save Pendergast. Constance has always been something of an anomaly in the novels. A character from another time that is part damsel in distress and part ninja. In this novel she steps up recklessly and boldly, her affections for Pendergast a protective nature that unleashes abilities once before hidden. One can only wonder if a solo novel of Constance Green is somewhere in the works. The team of Pendergast and Green is formidable and with any hope will be together for many novels to come. That is what Preston/Child have accomplished with these novels. They have developed the characters and not accepted any limitations to how they may evolve. Another fun and exciting read.